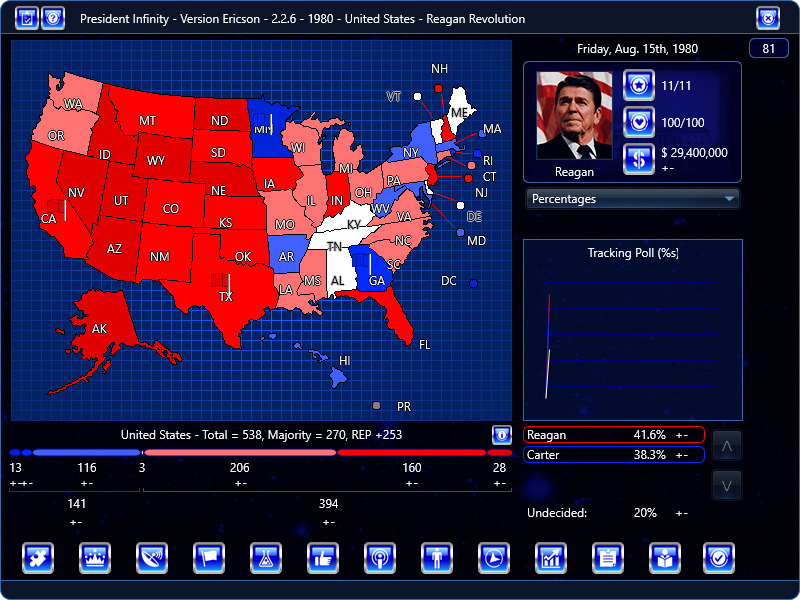 President Infinity will soon have United States – 1980 – Reagan Revolution added officially. Campaign installation instructions are here. All feedback welcome, including comments on attributes, issues, positions, %s, and so on. I’ll check out the sneak peek. I have little like for Reagan, especially his revolution, but I’m happy whenever any historical scenario is added to the game. – I’d fill out the candidate descriptions some more. I can help if you wish. – On Reagan’s stats, I’m wondering why he’s a stamina of 4. I would have put 3. You may have your reasons for putting it at 4. – Reagan’s charisma might need to be a 4 in this election, rather than a 5, since he couldn’t hold his party together. John Anderson’s independent run was due, in part, to Reagan’s conservative platform. – Bush’s debating skills should probably be a 3. He wasn’t a terrible debater. He was about average. His experience might be too high for a US Rep.
– Ford’s stamina might be too high at 5. He isn’t Teddy Roosevelt. – Baker’s integrity at 5 might be too high. I’d assume only a Supreme Court justice or someone completely incorruptible could be a 5. Maybe raise debate to 3, too. – I don’t think Dole is a charisma of 2. If he was, I doubt he’d ever have become a nominee in 1996. – Lots of the minor candidates have debate of 2. I’d consider moving them to 3 unless they are known as subpar debaters. – Jimmy Carter might have been a mediocre president, but he was a good debater. He’s a 2 in this game. I’d place him at a 4, probably. – I think an argument could be made to make Kennedy’s issue knowledge and/or experience a 4. Debate could arguably be a 4 as well. If his integrity wasn’t so bad, he’d be a great candidate on paper. – National endorsers such as Nixon and Ford could be added to the game. For Democrats, maybe former nominees like Humphrey and McGovern. – It isn’t necessary, but adding George W. Bush as an endorser for his dad might be fun. – Rev. Billy Graham is a surrogate for Connolly. Didn’t he endorse Reagan? Maybe he started with Connolly. Maybe make him a national endorser. – William F. Buckley, too, if he isn’t already. – More events could be added for sure. – Overall, it seems like it’s mostly done and well made. I think the Republican Party might be slightly too strong, since in my simulation, they controlled the entire map–every state–by Dec 1979. Democrats regained about 7 state by July. I am glad that this is finally being added to the game. One thing about the Republican primaries. Ronald Reagan was not on the ballot in Puerto Rico so he had 0% when the vote came around. Bush ended up winning with 60%. Also, I think it would be fun to have Harold Stassen and try to make a huge spoiler upset. I always like to play come-from-behind candidates. Yeah, along with Stassen, Lowell Weicker could be added. McGovern, Udall and Mondale could be Democratic what-ifs, since there was talk about them running. Republican what-ifs could be Jack Kemp, Douglas Haig and Elliott Richardson. When it comes to attributes you have to remember that they are set within the world of politics. If Carter were to debate some random guy in the street on pretty much any issue then he’d obviously own, but within the political world he’s below average. The time also has to be taken into consideration. He may not be quite as charismatic as an FDR or a Lincoln but Obama is still probably the most charismatic American politician of this century so far so he gets a 5 (imo anyway) on that score. I am aware of this. I looking at this in light of the scenarios that exist in the game. I also made scenarios 1788 through 1956 based on the method Anthony uses, with 3 being average. There are far too many 2’s in this scenario. Carter was actually an above average debater. Some thought, outside of the Reagan soundbite, that Carter won the debates. Carter was known then, as he is now, of being a quasi-intellectual. This doesn’t mean he was a good president, but he was good at supporting what he was saying, as unsound as it might be. Similarly, Cruz is an excellent debater, despite generally being proved that he made stuff up after the fact. I like that Anthony is very frugal about giving 5s to people. He’s also hesitant to give a 2 to anyone. I see 3s and 4s, much more often. I agree with his thinking. If Carter were a 2 in debate, I doubt he’d have gone from no body to a 1976 presidential winner. I also think he wouldn’t have gotten passed Ted Kennedy. Hey everyone, I happen to be working on this campaign for Anthony. Thanks for the great deal of feedback, most of which I readily agree with (the rest of which I’ll put in more thought about!). I will be making numerous adjustments as a result. First of all, thanks for the great scenario sneak peek! -Sen. Larry Pressler of South Dakota might be an option for the Republicans too. -And I was wondering, if you are going to add the Libertarians? They had David Koch as their running mate. Could be interesting, I think. Anyway great scenario guys, keep the great work up. Thank you so much!! 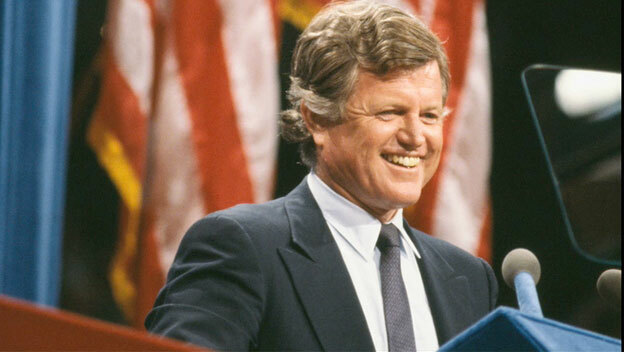 I’d suggest changing Ted Kennedy’s photo. Not a big deal, but his face is kind of obscured in that photo. Playing as Carter, I am fairly quickly (after making 5-6 surrogates) getting an error when I try to create another or recreate one that exhausted itself. Great so far, I recommend adding in the Libertarian Party as they broke 1%- I think the highest the party has received in the General. Ya, the Libertarian Party was also on every ballot. How do you download this and other scenarios? could someone please explain. Click the United States – 1980 – Reagan Revolution link in the post. I mean how do you install campaigns, not download. You should add Donald Rumsfeld as a running mate. He was heavily considered as a running mate for Reagan until Bush was picked instead IIRC. Also, when I click on parties in the campaign editor, I get the error “Access violation at address 004CF924 in module ‘PI.exe’. Read of address 00000018”. If you could really explain steps 3,7,8 @anthony, it would be a GREAT help. Can you say what about 3. you find unclear? To fix this, perhaps you should make events, like “hostages captured by Iranians” a HUGE boost to Carter…because, frankly, at the time they were taken, it did lead to a large boost in Carter’s approval and general election numbers. Granted, that lead faded fast after the Spring of 1980, but still. Thanks for the feedback – noted. On the to-do list is to make an import tool that automates this. When you click the Campaign Editor button and select a campaign, you then see the main Editor screen. On that screen is a line that starts with “Path:”. You want to put any downloaded campaign folder into the “user_scenarios” folder detailed in that path. You can access the “user_scenarios” folder through your file explorer, by navigating to the corresponding location. I never can open the path. I never see a line that says path? On the to-do list is a feature to automate importing of user-designed campaigns. I recommend waiting until it’s done. @Anthony – If it makes you feel better, it works fine for me. it never shows where user scenarios are. Can someone who has the mac version and has downloaded 1980 explain?